A new depth record for the precious red coral has been set, and it belongs to Malta! The deep sea around the Maltese Islands was investigated during two separate expeditions, in 2015 and 2016, as part of the LIFE BaĦAR for N2K project. During these surveys an underwater robot equipped with a video camera was used to explore the seabed down to depths of more than 1 km. 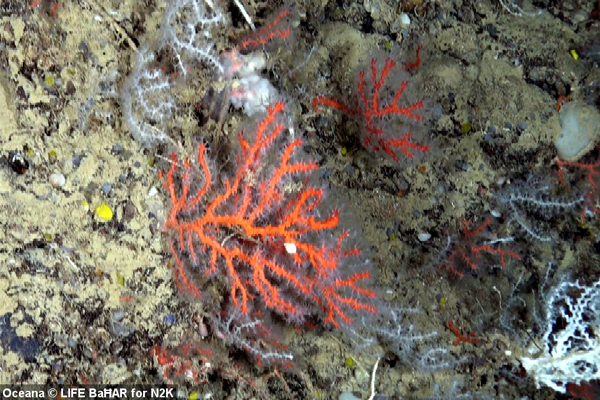 The project scientists were surprised to find numerous colonies of the precious red coral (Corallium rubrum) growing down to depths of 1016 m – over 200m deeper than the previous record, also from Maltese waters. The team of scientists from the NGO Oceana, who undertook the surveys, and the University of Malta’s Department of Biology, who were responsible for analysing the data, recently presented their findings at the 41st Congress of the International Commission for the Scientific Exploration of the Mediterranean (CIESM), which took place in Kiel, Germany from the 12 – 16 September 2016. Several other interesting findings made during the LIFE BAĦAR for N2K surveys were also presented at the CIESM congress. These included the discovery of a fossilised sponge reef at a depth of ca. 300 m, deep-water caves located at depths down to 450 m, as well as vast expanses of sand/mud habitats, inhabited by diverse communities of species including some rare and threatened ones. 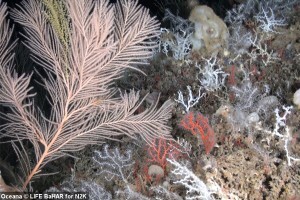 Ricardo Aguilar, expedition leader and research director at Oceana in Europe, remarked that ‘Most of the sites where we encountered diverse coral reefs had never been researched before, and the findings of the LIFE BaĦAR for N2K project indicate that the deep-sea around Malta represents an important biodiversity hotspot’. The LIFE BaĦAR for N2K project, through which these expeditions were funded, ultimately aims to ensure that vulnerable marine habitats, including deep water reefs, acquire protection through the designation of marine protected sites under Natura 2000, the European Union network that collectively safeguards the EU’s most valuable natural areas. The information gathered during the surveys will enable the formulation of more effective conservation measures to address the identified pressures, including from marine litter and discarded fishing gear. The LIFE BaĦAR for N2K project is co-financed by the EU LIFE+ Funding Programme, and is led by the Environment and Resources Authority (ERA), with the Ministry for Sustainable Development, the Environment and Climate Change (MSDEC), the Department of Fisheries and Aquaculture (DFA), the Department of Biology of the University of Malta (DoB-UoM) and Oceana as partners.